RALEIGH – The pitchers in the World Series probably don’t spend a lot of time thinking about the Civil War. But a little-known fact is that a form of the curve ball, one of the hardest pitches to hit in baseball, was first thrown in 1862 by Union soldier Alphonse “Phoney Ball” Martin, 9th NY Infantry. 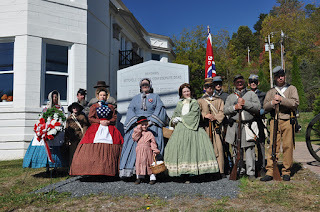 As the nation observes the sesquicentennial of the Civil War, military and social aspects of the time are being officially commemorated in the state by the North Carolina Department of Cultural Resources (www.nccivilwar150.com) through 2015. While stationed at Fort Reno on the northern end of Roanoke Island during the occupation of North Carolina ’s Outer Banks, Union soldiers often had free time. Martin, a native New Yorker, had played on a pre-war team called the Unions, one of 16 teams that competed regularly in the metropolitan New York area. Union soldiers brought baseball down South during the war, as it had originated in Maine as “town ball” and spread through New England . Martin was known for a slow, curved pitch that was incredibly difficult for batters to hit, and he earned the name “Phoney Ball.” After the war, Martin returned to New York and pitched for the New York Mutuals and the Brooklyn Eckfords. Although Martin pitched the curve during the Civil War, Arthur “Candy” Cummings is credited with inventing the pitch in 1867, playing for the Brooklyn Excelsiors. The N.C. Department of Cultural Resources annually serves more than 19 million people through its 27 historic sites, seven history museums, two art museums, the nation’s first state-supported Symphony Orchestra, the State Library, the N.C. Arts Council, and the State Archives. Cultural Resources champions North Carolina ’s creative industry, which employs nearly 300,000 North Carolinians and contributes more than $41 billion to the state’s economy. To learn more, visitwww.ncculture.com. RALEIGH – A former Union soldier, Albion Tourgée returned to North Carolina to settle in Greensboro in 1865. A lawyer, judge, novelist and activist, he worked for racial equality in the post-slavery South. The symposium “A Radical Notion of Democracy: Law, Race, and Albion Tourgée, 1865-1905” on Nov. 4, at the N.C. Department of Cultural Resources Building in Raleigh, will examine his legacy. Tourgée achieved national fame when representing Homer Plessy in the landmark Plessy v. Ferguson (1896) case before the U.S. Supreme Court. He lost, and “separate but equal” facilities and the practice of racial segregation were established. Through Tourgée’s efforts, the North Carolina constitution of 1868 guaranteed free public education. That and other achievements will receive special attention in the symposium, along with his lasting contributions to the national discourse on civil rights through the concept of a “color-blind” society argued in the Plessy v. Ferguson case. Eight panel discussions with distinguished scholars of law and history are planned. A dramatic presentation in the State Capitol of portions of the Constitutional Convention of 1868, will conclude the program, followed by a reception. Registration is required for the free symposium, which also offers education credit to teachers and lawyers. Register at http://tinyurl.com/3oeuct7. The major sponsors of the symposium are the UNC Center for the Study of the American South and the N.C. Department of Cultural Resources’ Office of Archives and History. A research arm of UNC-Chapel Hill, the Center for the Study of the American South (http://www.uncsouth.org/) is the region’s premiere institution for original research, teaching, and public dialog on the history, culture and contemporary experience of the American South. The N.C. Department of Cultural Resources annually serves more than 19 million people through its 27 historic sites, seven history museums, two art museums, the nation’s first state-supported Symphony Orchestra, the State Library, the N.C. Arts Council, and the State Archives. Cultural Resources champions North Carolina’s creative industry, which employs nearly 300,000 North Carolinians and contributes more than $41 billion to the state’s economy. To learn more, visit www.ncculture.com<http://www.ncculture.com>. Great news! The North Carolina Society of Historians, this past Saturday, honored two of my books, The Fifty-eighth North Carolina Troops: Tar Heels in the Army of Northern Virginia (2010) and North Carolina Remembers Gettysburg (2011) with the Willie Parker Peace History Book Award. This makes the seven and eight times that I have been honored by the Society for my books. Awards were also presented to several of my articles that appeared in Carolina Mountain Life, and one of my articles in the Tar Heel Junior Historian; these were given the D. T. Smithwick Newspaper and Magazine Article Award. Thanks to the Society for the honors. One other piece of personal news: I was recently elected to serve on the board of the Friends of Mountain Heritage Board, a organization made up of museums and historic sites in western North Carolina. I am looking forward to getting involved! My little break is over and it is time to hit the roads again. I hope to see you at one of these events. Tuesday, October 25, Sherrill's Ford Public Library (Catawba County), 6:30 pm. Thursday, October 27, Black Bear Books (Boone), 7:00 pm. Saturday, October 29, Blue Ridge Books (Waynesville), 3:00 pm. Mr. Sam Marks, of Shelby, is here, attending court. Mr. Marks is about six feet six inches high. There were in his company -- Capt. Joseph Harvey White's-- 81 men over six feet. He, messers. Louis Leon and W. R. Cochrane were in the same company. Mr. Marks and Mr. Cochrane saved Mr. Leon's life once in carrying him across the Potomac when all wasn't "quiet." Marks said yesterday: "If Lee had had 500 men like Louis Leon, Bill Cochrane and myself the war would have been going on yet.."
If you follow this blog regularly, you know that I've been on the road lately. A lot. All of this travel, in support of the new North Carolina in the Civil War, has taken me away from the Civil War Charlotte project. I have been reading, recently finishing the book on Philly and the War, and currently reading volume one of Blood and War at my Doorstep. I've also started to go through Confederate Veterans. Yesterday, I was back to reading the Charlotte Observer, finishing up the year 1897. I have found lots of great info about reunions and war stories. I'm not sure how much of it will make it into the book, but some interesting pieces nevertheless. Stay tuned for more information - the next few weeks are not nearly as hectic as the last few, and I'll have more time to get things sorted through. RALEIGH – Colonel Isaac Avery lay dying on the Gettysburg battlefield that sweltering July day. Struck in the neck by an enemy bullet, his writing hand was paralyzed, yet he was determined to record his last thoughts for his family. Found next to his body, scrawled in pencil and written with his left hand, was a scrap of paper with the words: "Major: Tell my father I died with my face to the enemy. I. E. Avery." Francis Poteet was conscripted into the 49th North Carolina Infantry Regiment in 1863, leaving behind his wife, Martha, and their children. In a letter to her husband posted June 16, 1864, she writes to him, “My baby will be 4 weeks old Saturday Night she was born the 21 of May write to Me what to name her.” Enclosed with the letter is a paper cut-out of the baby’s tiny hand. Promoted by the Society of American Archivists, American Archives Month raises awareness about the value of archives and archivists through public events and activities. North Carolina ’s theme, “Not Just A List of Names,” focuses on Civil War-related documents as the nation commemorates the war’s sesquicentennial. Also on display Oct. 24 will be documents telling the stories and names of the famous and not-so-famous. View a letter from Jefferson Davis to Gov. John W. Ellis dated May 23, 1861, congratulating him on North Carolina ’s succession; a Confederate soldier’s bloodied New Testament picked up from the Fort Fisher Battlefield; and a wooden pedestal hand-built by a Union soldier who came to possess the testament and where it came to rest. The event is free to the public and will be held in the State Archives Search Room of the N.C. Department of Cultural Resources Building, 109 E. Jones Street , Raleigh , N.C. 27601 . Yet another busy and great weekend - I love fall in western North Carolina. I got to spend Saturday in Old Salem, signing books at T. Bagge’s with Joe Mobley (Confederate Generals of North Carolina). We (my family) then spent the rest of the afternoon touring the town and visiting the shops. If you have not been to old Salem, you need to visit. It’s well worth the time and money. One story I will relate - we were standing on the porch of the old tavern reading the menu when my wife recognized a lady and her daughter whom we have not seen in 10 years. So, you never know who you will run into. On Sunday, we were headed to the far western parts of North Carolina. Several weeks ago, I posted about raising money to purchase a replacement stone for Brig. 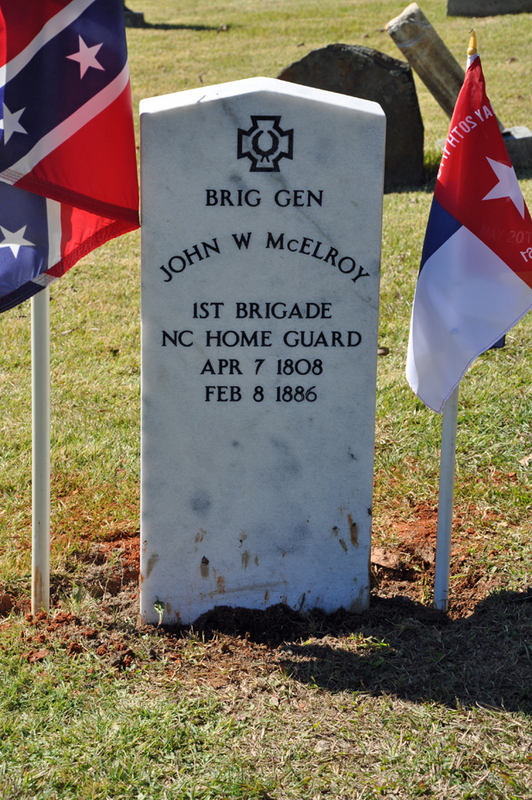 Gen. John W. McElroy, the commander of the 1st Brigade, North Carolina Home Guard. Our local SCV Camp raised the funds, and purchased the stone, and we were off to install the marker. McElroy is buried in the Old Mother Cemetery in Robbinsville, Graham County. The stone was installed, and I had a chance to address those gathered with a few words concerning the life of this man. Thanks to the Col. John B. Palmer Camp, Sons of Confederate Veterans, for making this happen. “Me and my pards” were then off to Cherokee County - being so close, we decided to do a little more cemetery crawling. After about 45 minutes on the road, we arrived at the Hanging Dog Baptist Church Cemetery. Like the Old Mother Church Cemetery, this burial ground is rather large - over 1,000 graves. 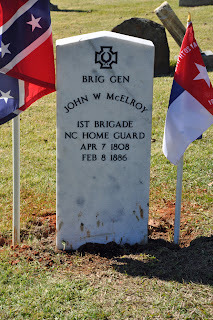 We came across the graves of numerous Confederate and a few Federals. 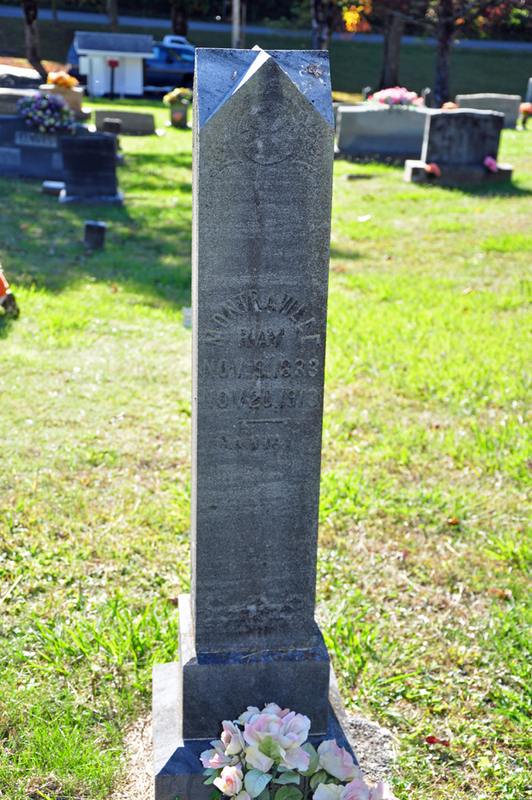 The grave we were hunting was that of Montreville Ray, a Yancey County resident that served one year in the 16th North Carolina Troops. After serving one year (to the day), Ray deserted. In April 1864, he helped lead a raid on the town of Burnsville. Because he led the raid, some have claimed that Ray was a Unionist. However, there is no record that Ray ever joined the Union army. He was in the column often labeled "other." Overall, a great weekend, but I am glad to have a few days off. So, I thought it might be time for an update - yes, I've been traveling all across our great state the past few weeks, talking to different groups about the war, and about my books (I'll be speaking tonight to the Rowan History Club in Salisbury). This past weekend, I dropped my pen and picked up my sword. It was the Mitchell County Sesquicentennial celebration. "Me and some pards" set up a Confederate camp along the Creek Walk in Bakersville. The camp included several stations, including a civilian station, officer's tent, enlisted man's quarters (complete with a half-dozen dog tents), stations on uniforms, common soldiers, flags, small arms, and artillery. On Friday, we had around 130 students - third, fourth, and fifth graders from Gouge Elementary -who visited our camp. They went through each of these stations, learning about the War on both a local level, and about the soldiers who marched away. The highlight was firing the 12lb Napoleon Cannon, provided by the Santee Light Artillery. The kids were all really excited when that big gun went bang! Well, almost all of them. One teacher, after staying about 10 minutes, thought her students would be better served by taking them back for P.E. So, you have some of the best interpreters in western North Carolina doing what they do best (not to mention North Carolina's Historian of the Year), and you think P.E. would be a better option? No wonder our nation's children are historically illiterate; teachers like this one think PE is more important. If she was worried about their physical fitness, we could have chased them around with bayonets. We continued Friday evening, providing candlelight tours of the camp, and once again focusing our talks on what happened locally. Firing the cannon at night was another treat. On Saturday, the new Mitchell County Confederate Monument, containing the names of 79 local men who died during the war, was dedicated. A conservative estimate of one hundred citizens joined about twenty-five members of the Col John B. Palmer Camp, SCV, and the Martha Reid Silver Confederate Memorial Association at the dedication. Several gave remarks, including Bakersville mayor Charles Vines. I had a chance to deliver the dedication speech, the third time I have had such an honor. The names on the monument were read, a wreath laid, and volleys fired. The afternoon was spent giving tours and talking to the general public. Overall, it was a great weekend! The weather was great, and I really like working with the students, making history "live" for them. Saturday, October 15, Old Salem Museum, Winston-Salem, noon. 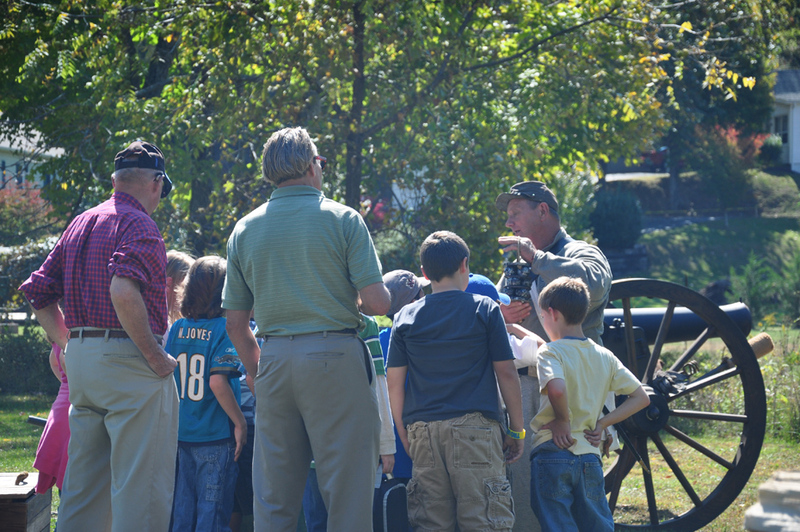 DURHAM -- A signature Sesquicentennial event of the N.C. Department of Cultural Resources’ Bennett Place State Historic Site, “Road to Secession,” will capture the patriotism and fanfare of piedmont North Carolina at the outset of the American Civil War on Saturday, Oct. 8, 10 a.m.-4 p.m., and Sunday, Oct. 9, 10 a.m-3 p.m. The weekend-long event, “Road to Secession,” will include a recruiting station that recreates the enlistment of young men and gives demonstrations of military drill and musket firing; civilian ladies practicing period cooking, sewing, and preparing care packages for soldiers; and an exhibition 19th-century style baseball game by the Greensboro Patriots against the locals and new recruits. Photographer Ronald Hudson will be on hand with period photography and portraits for sale. Mule-pulled wagon rides around the farm will be available. Vendors will have period products to showcase and sell, and the Huckleberry Brothers band will provide lively music. Jeff Bockert, assistant curator for education with the N.C. Department of Cultural Resources’ Historic Sites, will speak on uniforms and equipment of the North Carolina soldier. He is among several historians and authors who will speak in the Visitor Center theater. Brenda McKean will present her two books, “Blood at Our Doorstep, Life of the North Carolina Civilian During the Civil War, Volumes I & II.” Michael Hardy will present his latest title, “ North Carolina in the Civil War.” and Keith Jones will speak on “Boys of Diamond Hill,” a series of letters of a South Carolina family that lost four of five sons in the Civil War. The Sons of the Confederate Veterans Bennett-Duke Camp will show a genealogical research display. The mission of Bennett Place State Historic Site is to interpret the meeting of Union Maj. Gen. William T. Sherman and Confederate Gen. Joseph Johnston, whose goal in April 1865 was to bring a peaceful solution to the war and the surrender of 89,270 exhausted Confederate troops. The state historic site also interprets the lives of yeomen North Carolina farmers such as James and Nancy Bennett. Bennett Place is at 4409 Bennett Memorial Road , Durham , NC , 27705 . For additional info rmation call (919) 383-4345 or visithttp://www.nchistoricsites.org/bennett/bennett.htm. Yet another busy week. Maybe I'll be in your neck of the woods. If so, stop by and say hi! Saturday, October 8, 2011: Mitchell County Sesquicentennial Celebration, Bakersville, NC, All Day! 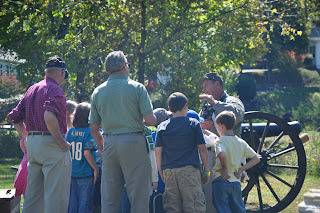 Sunday, October 9, 2011: Bennett Place State Historic Site, Durham, NC, All Day!